I have been reflecting on Gemini as the sign of the Twins, brothers and sisters, and the many faces of one thing. My contemplations been supported by the creation of a new online class: Vibrational Excellence. In class we are using archetypes: some ancient, others metaphysical, and still others contemporary or modern. Being archetypes, they too offer a one (principles) through many faces (twins). In that respect they bring Gemini to mind again. Yet I am still troubled by astronomy which points out that the Sun is in the sign of the Bull (Taurus). Add to that, Uranus is in Pisces and Pluto in Sagittarius. These planets and signs also point to archetypes and the many faces of inner reality. Truth be told, my deliberations on astronomical placements of planets in the zodiac keep bringing me back to a question of being stubborn. My mind feels plowed by the fact of the planet’s locations. I feel Taurus, earth, the tilling, and intractability. I wonder, am I just being stubborn about shifting from a tropical astrology point of view to an astronomically driven astrology? I feel out of alignment with tropical astrology the more I play around with the Stellarium software. Truth is truth right? Furthermore, why is humanity constantly faced with these Geminian dilemmas, these forks of information? Astrology and astronomy should support each other not bring one another into the question, especially since astronomy is the result of humanity gazing to the heavens for guidance. I am pretty reconciled now with an astronomical interpretation of my chart. The location of the planets in different signs was not far field to begin with. I was looking for one more factor to tell me that this is the correct view. Yes, it was silly to predicate my agreement with the astronomical locations of the planets by whether or not I agree with the interpretation of the qualities conveyed by them. But I feel pretty resolved as of now. It has taken a few years. So, I encourage everyone who has an interest in astrology to explore the qualities and vibrations that you are experiencing every day within yourself, to analyze the qualities and energies in their own right. Put aside name of sign and even what is called a water, earth, air, or fire temperament. Simply explore the nature of the energy, its demonstration, and the layers of quality that seek to be known. Astronomy and astrology were in sync for tens of thousands of years. I still don’t understand how they were separated and the birth of tropical astrology created. But I know that the master DK was very wise by not putting dates on the astrological signs in his book Esoteric Astrology. He simply explained the many layered energetics that astrology conveys. Happy full moon! I will celebrate Wesak again (Taurus /Scorpio full moon). But I will also hold my mind stream in the celebration of humanity and the Festival of Goodwill. I think there’s something profound that due to the holy days of Spring (Jewish, Christian, and Buddhist) the full moons of Aries, Taurus, and Gemini end up being celebrated twice by different factions of humanity. It’s an excellent use of duality. The wise ones do that and do it well! Spirit Fire and myself offer a free online full moon meditation each month. Join us for the full moon meditation, Tuesday June 2 at 8 pm ET. Register for the link. If you would like to use the webcasted visual presentation of last month’s full moon (focused on Taurus), it is on YouTube. Click here. The full moon cycle is five days long. Plenty of opportunities for meditation and world service! Vibrational Excellence has open registration. Join the over 20 people in the online course. Online courses can be done at your convenience or during the live sessions. Double click on the Stellarium graphic to enlarge. This entry was posted in Astrology, Esoteric psychology and tagged astrology, Astronomy, full moon. Bookmark the permalink. Maybe this will help: Vedic Astrology uses a sidereal zodiac, which means the planets are viewed based on the background of stars (sidereal) which is the same as the astronomy. 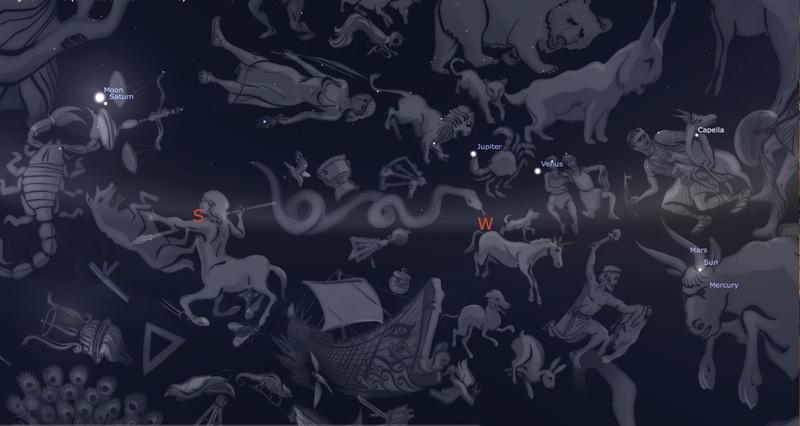 Western Astrology uses a Tropical Zodiac based on the seasons, so Aries will always begins on the Vernal Equinox no matter which actual constellation the Sun is in on the Vernal Equinox (which currently is Pisces based on sidereal/Vedic). Both systems work in different ways and with different means of interpretation. I suggest if you want to focus on location of the planets, take a look at your Vedic chart. thank you, Julianne. And my apologies for the tardiness of the response. Is the astronomical factor one of the reasons that you chose to study Vedic astrology? Is it correct that Vedic uses only the inner planets? (Saturn inward). And does it cast an Ascendant? Interestingly, the Stellarium program also only gives the snapshots with the inner planets, and I don’t see how to cast an Ascendant with it. I’ll check Solar Fire. What astrology program do you use? Thank you!